The GDPR is a EU Regulation designed to give you better control over how your personal data is used. While the major targets of the legislation are the big multinationals, like Facebook and the other big companies that sell your data for a profit, the GDPR applies to everyone including UNISON. Therefore, please take a moment to check the preferences you have given us that will let us keep you informed about what’s happening in UNISON both nationally and at branch level. It’s very simple to do this through your “MyUNISON” portal – for details see how to change your contact preferences below. Please check and correct your other personal details at the same time. Please help us to support you. 1. Go to the national UNISON website (www.unison.org.uk) and click on “My UNISON in the top strap-line (www.unison.org.uk/my-unison). 2. If this is the first time you have done this, you will need to register, which requires knowing your UNISON membership number. 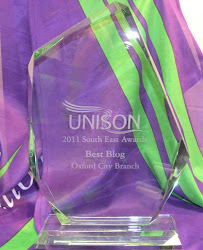 You can get this from your membership card or by ringing UNISONdirect on 08000 857 857. 3. If you have already registered and have an account, you will need to login (you will need your UNISON membership number and the password you created when you first registered. 4. Click on “My Details” and then “View full personal details here”. 5. In the top section titled “About you”, click on “Edit”. 6. Scroll down the page, completing as many details as you feel happy entering until you get towards the bottom, where it asks for Email addresses. 7. Please ensure that there is at least one email address (personal or work) entered and preferably enter both – please indicate which one you would prefer us to use. 8. 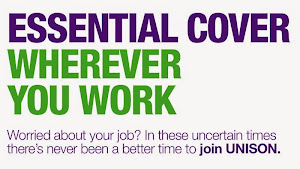 Please set “UNISON Mail” to “I am happy to receive correspondence from UNISON if appropriate” – if you do not do this, the branch cannot send you the branch newsletter, information about pay increases, etc. 9. If you wish to receive information from UNISON’s partners, you will need to set “Third Party Mail” to “Allow my details to be available for third party mailings”. 10. Please tick the box against “Email” or the branch cannot contact you by email. If you are happy to be contacted by phone and/or text as well, you should tick those boxes as well. 11. Click the “Save button” and then “Log out” in the top strap-line. Long hours, lack of staff and increasing stress have become a fact of life for public service workers. Our anxiety does not empty tomorrow of its sorrow but only empties today of its strengths. Is it worth the money to be in UNISON? A question we are asked a lot, and it is always great to receive feedback from our members, proving that when you need us we are there to support You, during and after your time of need. I just wanted to thank Unison for the recent support I received during a disciplinary investigation/hearing. I was until recently wondering whether to cancel my membership as I thought it was not that important to me and i wanted to try and skim my finances down slightly however I’m really glad i didn’t as the support i received from Lorraine Francis was brilliant and I really appreciated someone so knowledgeable to help and support me through the matter. Lorraine was not only supportive but gave tremendous empathy as she knew my job role. My experience was positive and I really appreciated the help. Well done Unison and Lorraine !! If you ever struggle to pay your membership subs or are thinking of leaving us, please talk to us first, we may be able to help or guild. 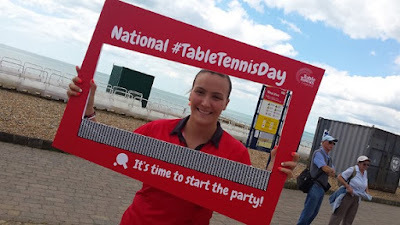 The date for National Table Tennis Day has been announced! Register your interest to be the first to hear about our exciting plans for the day and how you can get involved! We are here to help, all you need to do is ask..
With April marking Stress Awareness Month, a new report has found UK businesses are in danger of having their workforces experience burnout, as despite a huge number feeling stressed at work, few bosses are doing anything to help. For those British adults in employment, work is by far the most common cause of stress (59 per cent). Yet almost one in two (45 per cent) of British businesses do not offer anything to help alleviate this, according to a study of 3,000 UK workers carried out by Perkbox, the UK’s fastest growing employee benefits platform, as part of the 2018 UK Workplace Stress Report. This is despite the fact that one in four (25 per cent) struggle to be as productive at work when stressed, and almost the same number find themselves disengaged with work as a result. In fact, at least one in 10 (10 per cent) of us will call in sick due to stress, while seven per cent will look for a new job. There has been some changes to the UNISON membership form, and this is why. 17 Science-Backed Ways to Relieve Stress Right Now! The national living wage and national minimum wage set minimum hourly rates that employers must legally pay workers in the UK. How much is the national minimumwage? National minimum wage levels vary, depending on your age and whether you are an apprentice. It is reviewed every year, with changes introduced every April. £3.70 for apprentices under 19, or in the first year of their apprenticeship. £3.50 for apprentices under 19, or in the first year of their apprenticeship. The top tier of the national minimum wage, payable to workers aged 25 and over, was labelled as a “national living wage” when it was introduced by the government in April 2016. The government has set a target for this wage to rise to 60% of average earnings by 2020. However, the wage does not truly reflect a living wage, since it is not based on the cost of living. The Living Wage Foundation, an independent organisation that campaigns for a living wage based on the true cost of living, announces its independently calculated wage rate at the beginning of living Wage Week, which takes place over the first week of November every year. The living wage currently stands at £8.75 an hour outside London, and £10.20 an hour in London. Who is eligible for the national minimum wage ? Most workers are eligible for the national minimum wage – even if you agree to work for less or your contract says you are entitled to less. Employers are legally required to pay at least the national minimum wage. If you are being paid less than the national minimum wage, speak to your UNISON representative. They can help you receive the correct amount of pay. This video looks at the story of someone with work-related stress, and how they dealt with it and were supported in the workplace. Stress Awareness Month takes place every April and has since it first launched in 1992. Throughout this period of time, teams of experts aim to increase public awareness about stress. This includes highlighting the causes of stress, the negative effects stress can have on the mind and body, and how to relieve stress. Most people will experience stress at some point in their life, but constant or extreme stress is bad for both the mind and body. Stress can be caused by a sudden traumatic event or even just the expectations of daily life. There are many ways to minimize stress such as maintaining a healthy lifestyle, talking about your feelings, and dedicating time to relaxing. If you are suffering from stress, you can find help and resources on the internet, or you can seek advice from a healthcare professional. If left unchecked, stress can be deadly — in fact, stress is often referred to as the “silent killer” because although its effects are not immediately apparent, it can lead to a number of serious health problems such as high blood pressure and heart disease. This is why Stress Awareness Month is important — it informs people about stress and provides them with the tools and resources to manage it.